Who knew hot air balloons was the preferred method of transportation in Asia Pacific? I demand all future Microsoft reports to be presented in a similar style. There is a part of me that enjoys visual representations that are colorful and attractive. That part is dwarfed by a part of me that believes unstructured info-graphics are extremely ineffective (and dangerous) means of communication. There isn’t a logical flow to the colors, images, or data in this info-graphic. It’s a collection of data that becomes hard to read and an exploration activity. One with no clear path as to what your interpretation should be or what is being hypothesized. Not only that but without seeing some of this data in clear context it can be very misleading. 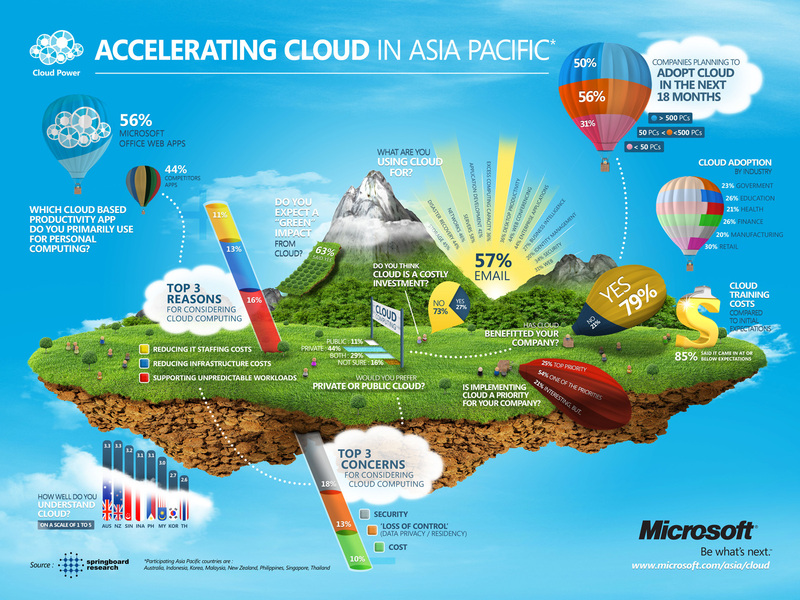 Especially simple visual cues like the balloon on the top right which shows three statistics (separate ones) in a single image creating a false sense of more companies planning to adopt cloud than the data (without images) conveys. As an advertising mechanism I can see this as being useful and flashy, but as a way of sharing data and information I really strongly believe it’s less effective. I was able to follow it! The analogies of the graphs make sense, and the creativity on it is icing on cake. Good job on this infographic!